Rural areas are exposed to a higher degree of pesticides and chemicals used in farming compared to urban spaces. Mostly due to monoculture agricultural practices. The countryside also lacks diverse pollen and nectar sources. Their food supply is then damaged and the quality of their honey is in decline. Bees survival is impacted by changes in climate. Therefore, temperatures in cities typically average to be higher in winter months than temperatures in rural areas. Bees and their colonies are being transported thousands of miles by companies that are monetizing off of their transportation services. Arguably, transferring bees over long distances and moving their colonies time and time again is a direct component of honeybees dying due to stress, disease, and malnutrition. In order to assist these startling factors, people around the U.S. and world have taken it upon themselves to create a safe and friendly environment for our bees. Now, we can find beehives on rooftops, small gardens, backyards, and in your bustling neighborhood community! Our country has been taken by storm by monocultural farming practices. Monoculture is a field defined by a single crop species. This form of agriculture maximizes profit for its constituents, but has serious ecological implications. Unfortunately, this farming practice is a severe detriment to our beloved bees. Industrial agriculture has simultaneously lead to commercial beekeeping and the practice of transporting bees over thousands of miles, only for the bees to inherit disease and other malnutrition. Overall, more and more people’s senses are becoming heightened in investigating where their food comes from. In turn, people want to be assured of what exactly is being put in or not put in their food. Cue in city dwellers. Gardening is not just for the landowners found away from the city. Because over half of the population resides in cities, urban residents have taken to the sustainability hype and have crazed out over the potential of having their own garden! 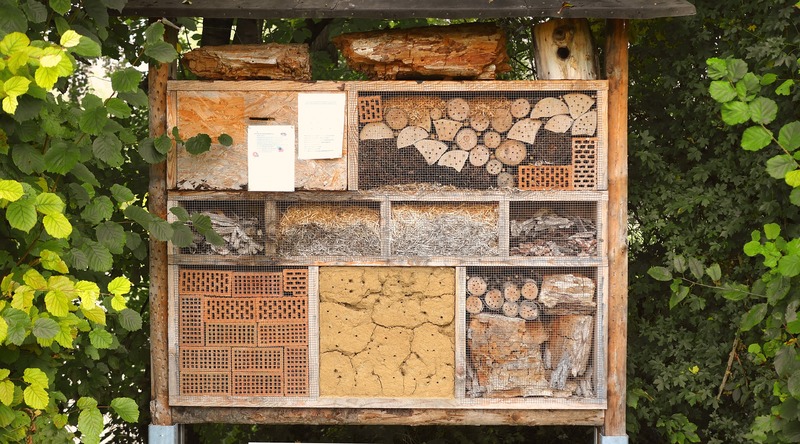 What does urban gardening have to do with beekeeping? Funny you should ask! Hopefully, after reading our blog on Bees and their Benefits, you understand that pollination ensures that a plant will produce full-bodied fruit and a set of viable seeds. Incorporating bees into your backyard or rooftop garden solidifies the odds of your plants being pollinated. Not only your garden, but ALL of your neighbors’ gardens within radius will reap tremendous benefits. On top of that, it gives bees and their colonies a noninvasive space that is safe to obtain optimal health. Those who have the sustainability fever, but love the bustle of an urban setting don’t have to be without beekeeping! Take New York City, Detroit, or Los Angeles for example. All major cities which have been sanctioned to house beehives. If those that want to grow their own food are concerned with what’s being put in their food, such as pesticides and other harmful additives, they would make the perfect urban beekeeper! Especially since bees would be less likely to encounter large amounts of harmful chemicals which are commonly used in rural and mass crop settings. Although urban beekeeping has the potential to benefit your garden, let’s consider how it helps the bee population first. Your backyard, rooftop or community garden has the ability to be an oasis for the honeybee. Boosting the overall bee population, and engendering safe, ethical, and long lasting spaces for them to just ‘bee.’ One of the best things we can do is to create a small space in our garden for bees! They will thrive with the hustle and bustle of the city, buzzing around with their new found nectar friends. If you’re wondering what the next step is, why not consider taking a class on beekeeping, that will enable you to give the hive and your garden the best chance for success.